US. Hello Jeffrey. Read the entire comment section and didn’t find an answer to this inquiry. I keep getting ‘no robots thanks’ numerous times. could you please explain what I may be doing wrong. I’ve been trying to look at online websites product shots to see when they may have been shot, or at least added to the advertisement. I’ve used ‘copy image location’ and ‘copy link location’ in side menus. – Do you save photos uploaded to your service for metadata-check? – Do you save any records of the metadata in search users do? Hi Jeffrey. Love this tool and have been using it for years during esafety sessions to educationalists to demonstrate the use of location settings. Good and bad. Recently I can no longer get google maps to work and that was my party piece. Can you advise why this is and what I need to do to get it working again. It is a fabulous tool for education. Thank you for Your quick answer. I’ve just donated $10 for Your great service in Exif Viewer. Keep up! Mirror lock-up in metadata: Is there a way of identifying pictures taken with this function? I am shooting Nikon equipment. Hi Jeffrey, first of all i want to say that i love your work with this free platform. I will donate you something. Second, i wan’t to know if an image is copyrighted or not. My question is: What information (of your platform) i must look to know that? Thank you so much for your work, and take a look of my webpage! I would like to save or print a copy of the meta data report. Can you help me with this? When I save it the picture images do not save. When I try to print nothing happens. Hello Jeffrey. Thanks for the nice programm to discover the exifs. But I have a question. In the exifs we can see a lot of different dates. Date in the basic image informations. Which of them is the date that the picture was taken ? I live north of Chicago in Illinois. Have just started using your tool in my workflow to derive sublocations. Tool is great, really appreciate using it and I know I am only scratching the surface. Many thanks. Hello from Ireland. I am trying to get an exact date a photo was taken as opposed to the date it was uploaded to a popular social networking site if you can assist please? I need help identifying where this picture was taken that someone posted on fb. I’m in Illinois. I often get photos from people who are using photos as documentation of property they previously owned an was stolen. These photos are normally coming from cell photos but I can’t seem to get metadata indicating when the photos were taken. I have them forward the photos to me from their cell phone. I right click on the photos>properties but the “origin” metadata is blank. Does this mean it doesn’t exist? I have put them on my desktop>searched for them through your site but your reader often doesn’t have the “origin” metadata. Can you help? Your site has been very helpful over the years. I was just curious, once uploading images and viewing the Metadata are the images stored on the website or do they automatically delete from the system? I’m interested in the privacy of the site. Hi Jeffrey, I am from South Africa. I seriously need your help. A lot of my photos do not have ‘date taken’ info under properties and I need to figure out what date the photo was taken in order to organize my photos. It’s really important to me to have the date of when the photo was taken. Please, can you help me? Does this program of yours have that info? If so, where do I look? Thanks so much in advance. When using the on-line Exif tool, I don’t get the same display as you show on your website, specifically your display in upper right of the screen. In other words I don’t get the option to drag the browser button to my toolbar (FF56) to be able to use the tool locally. 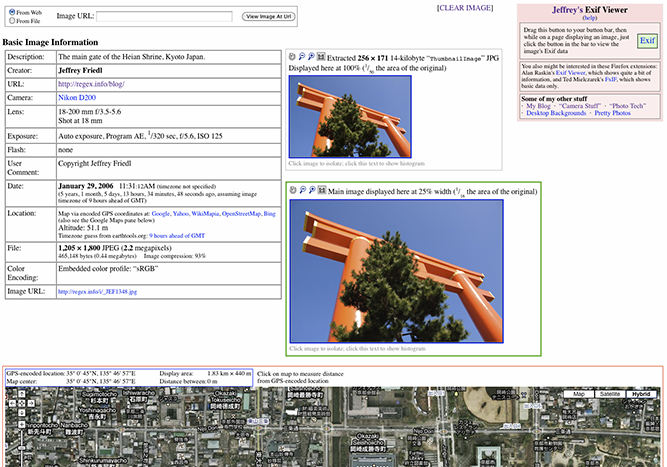 In fact the image input section is somewhat different (upgrades?). Did you delete this function? I am trying to determine the location of a photo posted to Instagram. Your program gives me an error message that the URL is a webpage, not an image. Please let me know in what type of format the URL should be. For instance, I’m trying to determine information about the following image: https://www.instagram.com/p/BejHr_in8Lc/?taken-by=northtrooper. Nice tool though! I just have to get the hang of it. Do you plan on adding support for HEIC? Your very useful Exif tool came up with a location (correct) found from coordinates. But, my Pentax Q has no geotagging capability, so where did the coordinate info come from? I have not seen that from any other camera. I would like to know the number of pictures had been taken with my cámara, in theory is brand new, but I have my doubts. I am in the process of analyzing a digital jpeg image. In the metadata view I see a category “Photoshop” and it references an IPTC Digest followed by a string of alpha numeric sequence. Does this indicate that the image was loaded into Photoshop and possibly altered? Thanks for this fantastic utility. I’m shooting with Nikon gear and sometimes (as in architectural and wildlife photography) need or wish to check focus distance data, which Nikon’s software does not display. Your viewer does, right up front, and then goes on to display the Maker Notes, where the focus distance resides, which Nikon’s photo editors do not even touch. Very useful, very helpful. Hye jeffrey, greetings from Malaysia. I’m now working on my final year project, and I need to develop a steganograpyh detection tool and extracting metadata from image is one of my function. I find your metadata viewer is so easy to use. Any chance, you can share the source code with me or lead me with any source code. Thank you, I really appreciate. I admit that I do not know how to read your color space data. I am trying to find a way to measure the area of my image that is green. I have found color histograms on other image sites, but they are not quantified. Is there a way (percentage of image area or number of pixels) to get this data with an online tool? Is the data there an I just don’t know what I’m looking for? “Photoshop” with “IPTC DIGEST” followed by many numbers and letters under the full data, does it mean that the photo was used in photoshop?